Space Patrol monitors the available space on your local hard disk drives and provides a notification when the configurable threshold level is reached. Unlike the built-in provision in some of the Windows operating systems, Space Patrol gives you full control over the threshold level and, where possible, provides a consistent notification user interface for all supported versions of Windows. Expand the zip file to a directory on your machine and run the setup program. During setup, you'll have the opportunity to configure the settings, and once you've completed that, the last step of Setup informs you that Space Patrol is installed and briefly tells you how to use it. If you're upgrading an existing version, setup may need to restart Windows. "Advertises" Space Patrol on all the machine's users Programs menu items. When a user invokes the Start->Programs->JD Design->Space Patrol->Space Patrol Documentation option, the installation will complete. Performs an "administrative" installation to a shared network location. How Do You Use Space Patrol? Setup configures Space Patrol to start monitoring automatically when you log onto the computer. It does this by adding a registry setting to automatically start the monitor program when you log in. You can configure Space Patrol during Setup, or at any time, by using Start->Programs->JD Design->Space Patrol->Configure Space Patrol. Note that the configuration program requires elevated permissions. If you have UAC enabled, you'll be prompted by Windows UAC when you start it. The Space Patrol configuration program displays your disk drive information and suggests where you may want to alter the setting. Monitoring can be enabled per-disk drive, and for those operating systems that have an inbuilt low disk space notification facility, Space Patrol lets you disable the operating system's facility. For Windows XP and later, this setting affects the HKEY_LOCAL_MACHINE\Software\Microsoft\Windows\CurrentVersion\Policies\Explorer NoLowDiskSpaceChecks registry setting. To alter the threshold setting, select the drive and double click (or use the Modify button). 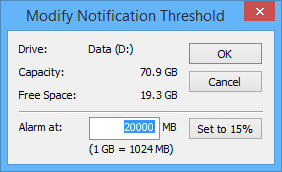 Alter the notification level using the "Modify Notification Threshold" dialog. If you want to disable the operating system facility, check the "Disable the operating system's built-in low-disk space checking facility" button. When you've configured the settings to be how you want them, press the Apply button to commit the settings. If you've altered the settings so that the low space setting is effective, you should see a notification icon appear in the taskbar notification area and, depending on your version of Windows, a popup notification indication. This notification will recur periodically, getting less frequent the longer the low disk space situation persists - so as not to annoy you too much if you choose to ignore it. Here's how the notification looks under Windows 8.1. The actual presentation is different under different versions of Windows. An unregistered version contains the full functionality but won't automatically apply the saved settings when you log on - you have to run the "Configure Space Patrol" menu item and press the Apply button. The easiest way to register is by credit or debit card and one of the secure online payment facilities available from our web site. Once you've made the payment, we'll email your registration information to you as soon as possible. Copy and paste your registered name and number into the About dialog box. You can access this dialog from the Space Control configuration dialog's "About" button (see the screen shot above). You must enter your registration details exactly as they appear in the email. The case, spaces, and punctuation of the name are significant. The number is composed of the characters 0-9, A-F and again, the case of the letters is significant. If you register the set of utilities, be sure to use the correct registration number for each product. You can check that registration has worked by re-displaying the About box from the main dialog. When the product is successfully registered, what was the Register button on the main dialog will now be labeled "About", and your registration name is displayed in the About dialog rather than the entry fields. Any updates to the current version are free to registered users by downloading the latest version from our web site. Your current registration number will continue to work with updates. For up-to-date information, check the FAQs on our web site. Use the Control Panel, Add/Remove Programs (Programs and Features) applet and choose the Space Patrol item. We maintain a list of frequently asked questions on our web site. If you have a technical question, please check there to see if you can find an answer before contacting us. We will post the latest versions of our utilities on our web site as soon as they are available, so please take a look to keep up to date and to see what other software and services we offer. If you have any suggestions for improvements to any of our utilities, please contact us via email (our up-to-date address is on our web site's contacts page). It's always good to hear from people using our products, and we appreciate your taking the time to tell us.